Split Screen Summer Finale episode featuring Kidspirit! Check out the summer finale of KBVR TV's Split Screen, where Jeff "Spirit" Baxter reps KidSpirit and shares the experience of a KidSpirit leadership staff, all while playing a game of Splatoon 2! "While many college students flock home during the summer term, kids from kindergarten through eighth grade get to take on the Oregon State University campus at the KidSpirit Summer Day Camp. Around 400 campers gather each week enhancing the atmosphere here at OSU." "Gage Moss was serious as he counted silently down at the start of filming. He held up three fingers, slowly put one down, then another, and another; then he made a fist at zero. "New researchers using pedometers to monitor activity levels of campers"
"Kathy Gunter and her research team, which comes from the College of Public Health and Human Sciences and OSU Extension Services, have started research to monitor children’s activity levels while they are at camp. The staff attach pedometers to the campers for a half-day session of classes, snacks and group activities." "This Saturday, Aug. 18, Many Hands Trading has selected Oregon State University KidSpirit for their monthly fundraiser, 'Day of Sharing.' "
"Most people scheduled for a lumpectomy a mere month after a breast cancer diagnosis would be inclined to have a spouse or loved one drive them to the hospital. Not Karen Swanger. She ran." Students and staff to perform a version of "dancing with the stars"
"Tonight, students will be able to see campus celebrities in Oregon State University's very own version of 'Dancing With the Stars.' "
"KidSpirit director Karen Swanger likes to dance, but is feeling just as anxious as she is excited about Oregon State University’s 'Dancing with the Stars,' scheduled for Thursday evening at the LaSells Stewart Center." 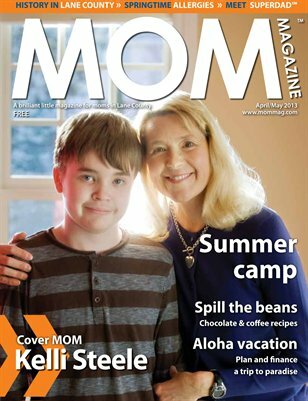 Check out the April/May 2013 edition, page 10, to read about one of our veteran campers Brian Steele! "The KidSpirit program, part of the Health and Human Sciences department, is nothing new. In fact, the program started at OSU in 1961, leaving many questioning why there were over 270 applicants for around 65 staff positions for the 2010-2011 school year." "What started as an idea over a meal at Pangea culminated with the first meeting of KidSpirit staff and donors last Friday. With classic Disney songs in the background and peanut butter and jelly sandwiches serving as the entrée, the guests were there to learn more about the brainchild of Adam Aguilar and Kasra Azizian: the KidSpirit Giving Program." On August 14th, 2012, the Gazette Times featured KidSpirit in To Your Health! KidSpirit is highlighted in this Daily Barometer Article. Karen "Big Mama K" Swanger is featured in the 2011 Daily Barometer for Girls on The Run. The Daily Barometer also covered the giving program back in 2010 with this article.